You have to admire an author who stands an academic/cultural trope on its head. We’ve all heard of The Tragedy of the Commons, right? Heavy. Very heavy. Robinson brings us…the COMEDY of the Commons! I love it. Among other fancies, he produces a new Tom Sawyer/Huck Finn duo, Stefan and Roberto, a pair of “water rats” who live by luck and their wits in a stolen Zodiac in the drowned city of Lower Manhattan. This book reminds me of The Martian by Andy Weir. In The Martian, one man fights a planet for survival. In New York 2140 Robinson creates a crowd of lovable eccentrics and follows their struggles on the hard-to-recognize landscape of New York after sea level rise. The basic scenario of New York 2140 is that sea level rise, happening in two “pulses” rather than slowly, has transpired and a great deal of land has been abandoned. But New York City is just too valuable, so it evolves into three zones – dry land in northern Manhattan, an “intertidal” zone and a marginally occupied, heavily damaged Lower Manhattan. The book takes place in the intertidal zone, which is starting to “gentrify”. Robinson quotes a number of sources throughout the book, mostly at chapter headings. Robert Moses, for example, who ruthlessly imposed his vision on the New York infrastructure. Additionally, H L Mencken, Henry David Thoreau and Herman Melville, and assorted scientists and commentators. Some are worth checking out. Robinson makes a “character” out of an existing building, the Met Life Tower on Madison Avenue. It is portrayed as having “personality”. In 2140, it is occupied by a housing cooperative. New York is very crowded, so successful professionals pay dearly for even a tiny bit of space, like a bunk in a dormitory. Characters in New York 2140 make occasional reference to Thomas Piketty, whose book Capital in the 21st Century has been attracting attention recently. Piketty is a French academic who has studied the history of the distribution of wealth. Both Piketty and K S Robinson are asking how capitalism can be structured to benefit the citizens of a democratic nation. Believe it or not, there’s a copy of Piketty’s book in my livingroom. I plan to read at least some of it. Stay tuned! I dashed excitedly through New York 2140 in a few days, and I’ve written this without consulting reviews. After I do that, I may learn that, one way or another, I’ve entirely missed the point. Nora Ephron is almost my contemporary, but the eight year age difference between us is, in fact, a big deal. Born in 1941, she faced a level of sexist chauvinism which was being challenged by the time I graduated from high school and headed out into the world. Ephron’s life is an interesting study in American feminism as it emerged after World War II. I admit to being only sketchily familiar with her books and movies. I saw “Sleepless in Seattle”. 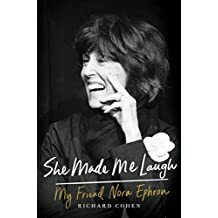 Richard Cohen, nationally syndicated columnist for the Washington Post, wrote about Ephron because they were best friends. Inadvertently, he provides insight into the New York City world of the rich and famous (and those aspiring to be…) There’s a little too much name dropping, but the affection that underlies the writing is unmistakable. I think Ephron’s book Heartburn falls into the category of “guilty pleasure” fiction. It’s based on the breakup of her first marriage, which happened at a time when women were often advised to turn a blind eye to spousal infidelity. I can’t help but be disturbed by her fictionalizing her family (especially her children) so extensively. She was, according to Cohen, absolutely confident that she did no harm. I believe Ephron has been compared to Dorothy Parker (1893-1967) whom Wikipedia describes as “poet, satirist and critic”. I read a biography of Parker and would describe her as brilliant but mean spirited. I think Ephron was equally bright and talented, but far more kind and generous. If you enjoy biography and/or contemporary gossip, this book is a good read. See my blog post of August 7, 2016, for information about Simsion’s earlier novel. This is the second novel about the autistic genius Don Tillman and his brilliantly flamboyant wife Rosie. Don is still trying to figure out “normal people” and emotions. His wife’s unexpected pregnancy throws both wife and husband for a loop. Simsion draws out the confusion extensively – hey, that’s what romantic comedy is all about! Along the way he creates some great characters. There’s Bud (baby under development), and Aaron the Air Marshal ( assigned to determine if Don’s autistic behavior means he’s going to blow up a flight to LA) and the B-team, three researchers dedicated to explicating the reactions of babies to lesbian mothering. This book is wildly funny. Read it for good laughs! I hope for a sequel. Published in 2009, 294 pages. I wish this book had been published with its working title (discussed in the introduction) of “sortabiography”. I like that. Last Words sounds Biblical, and not very Carlin-esque. George Carlin was a rebel from his earliest days. His mother had the strength and good sense to leave an abusive marriage, but his older brother had already suffered terribly and his mother’s efforts to get cooperation and conformity from George were completely unavailing. At age 17, with his mother’s consent, he entered the Air Force. He was discharged on vague grounds after two courts martial and other infractions. I’ve heard the expression “not suitable for regimentation”. Sounds like George. What Carlin and Hendra have in common is the satiric outlook on life. In Carlin’s case, this can get pretty dark. At one point, he contemplated an HBO special to be entitled “I Love it When Lots of People Die”. This was changed due to bad timing – September 11, 2001, came and went, and even Carlin knew it wasn’t funny any more. But you know, in a weird way, I get it. I have a close friend who roots for every hurricane that comes up the Atlantic coast. It’s not that he really wants people to die, but sometimes he really wants the storm to win. Many of us root for the forces of chaos on occasion. I have a particular fondness for Tony Hendra because of how much I enjoyed his book Father Joe: the Man Who Saved My Soul (2004). See my blog entry of January 21, 2014. A “sortabiography” of great wit and charm. At the end of Last Words, Carlin circles back to consideration of his childhood and discusses his desire to write a musical about it, which he proposes to call “New York Boy”. A good idea, and I wish it had happened. I wonder if he was thinking of the book Boston Boy by Nat Hentoff. Hentoff was a jazz critic, scholar and political commentator, a decade older than Carlin, and still writing at age 90. “Boston Boy” could be the backbone of an excellent musical, but I can’t find evidence that anyone is working on it. Carlin says that he identified more with the rebel musicians of the 1960s (and earlier) than with his comedy peers. He probably knew and admired Hentoff. So… If you are a Carlin fan, a student of contemporary America or a comedy lover, read this book! The problem with this book is that it must be read through two totally different lenses. First, it is the memoir of a dying man. Judt suffered from Lou Gehrig’s disease, also known as ALS, one of the cruelest neurodegenerative maladies. ALS leaves the mind trapped in a paralyzed, helpless body. Judt died two years after he was diagnosed. His original symptoms were those of a mild stroke. So what about The Memory Chalet? It’s a charming book. The “chalet” is Judt’s alternative to The Memory Palace of Matteo Ricci (by JD Spence). Suffering through torturous nights in his quadriplegic condition, Judt needed a mental “device”, a mnemonic, to remember the essays he “wrote” in his head. He remembered a chalet in Switzerland where his family used to vacation. It was a humble, 12 room hostel he recalled in comprehensive detail and which had, for him, a wonderfully positive ambience. Moving through it in his mind allowed him to organize his ideas and recall them later for dictation to an assistant. What did he write? A great deal was about his childhood and education. He loved trains, hated school, became aware of his Jewish identity… The picture he paints of post war England is detailed. It’s hard for us, looking back, to understand what “austerity” meant. Judt fills in the details, and also elucidates the sense of solidarity, of unity, that England experienced after WW II (and has since lost). Judt became interested in politics very young (14?) and embraced Zionism and socialism to the extent of spending extensive holidays on a Kibbutz. His parents were displeased when he spoke of moving to Israel permanently. Of these experiences, he says “Before even turning twenty I had become, been and ceased to be a Zionist, a Marxist and a communitarian settler: no mean achievement for a south London teenager.” To the relief of his family, he enrolled at Cambridge and studied history. What about Judt the “public intellectual”? He taught at various universities and wrote extensively. His original field was criticism of French historians (hope I got that right). He says his book Postwar: A History of Europe Since 1945 (2006) secured “public intellectual” status for him. He tried to overcome the Western European habit of ignoring important events in Eastern Europe. He describes his decision to learn the Czech language as a turning point in his intellectual evolution. Judt described himself as a “universalist social democrat”. It’s going to take me a while to parse that. In the meantime, I think it would make a good mantra. I might read Postwar, but more likely will look at Thinking the Twentieth Century (published posthumously, coauthored by T Snyder) first. Written in dialogue format, it is sounds accessible to non-historians like me. “Tepper Isn’t Going Out” by Calvin Trillin – urban fiction at its very best! Reading about cities (see previous post) caused me to grab this old favorite off the shelf. This short novel is a paean to New York City and its residents. The hero is a mild mannered businessman who develops an eccentric hobby. He hunts for and occupies parking spaces even though he rents space in a garage to avoid the endless business of moving the car from one legal spot to another. Unintentionally, he attracts attention and polarizes public opinion. In this novel, Trillin pokes fun at almost everyone. My kind of humor. Read it when you want to cheer up. My first exposure to Trillin was his book Alice, Let’s Eat, which left me weak with laughter. Now he writes satirical political verse for The Nation. Thank you, Calvin Trillin, for years of wonderful writing!